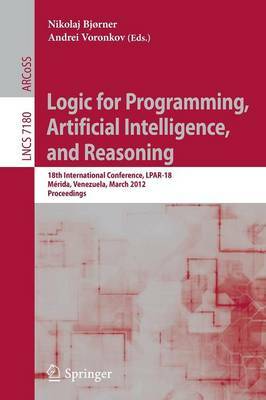 This book constitutes the proceedings of the 18th International Conference on Logic for Programming, Artificial Intelligence, and Reasoning, LPAR-18, held in Merida, Venezuela, in March 2012. The 25 regular papers and 6 tool descriptions and experimental papers presented were carefully reviewed and selected from 74 submissions. The series of International Conferences on Logic for Programming, Artificial Intelligence and Reasoning (LPAR) is a forum where, year after year, some of the most renowned researchers in the areas of logic, automated reasoning, computational logic, programming languages and their applications come to present cutting-edge results, to discuss advances in these fields, and to exchange ideas in a scientifically emerging part of the world.